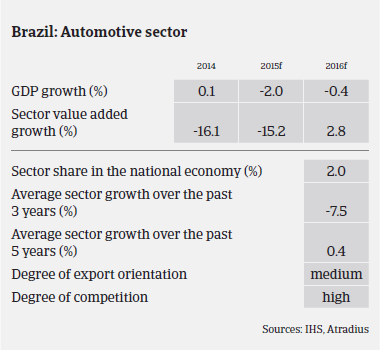 The downturn of the Brazilian automotive sector seen in the first half of 2014 has accelerated since then, in line with the economic slowdown: after a mere 0.1% GDP growth in 2014, Brazil´s economy is expected to contract 2.0% in 2015. Public spending has been cut, and household spending power has considerably shrunk due to a persistently high inflation rate of more than 9% and higher unemployment (which increased to 7.5% in July 2015 from 4.3% in December 2014). The economic performance is also affected by massive exchange rate volatility and scarce credit due to a very high benchmark interest rate (14.25% in September 2015), hampering both household and business lending and investments. Government-controlled banks, which pushed car loans and other consumer credit in previous years, have restricted their lending. The downturn has an impact on the whole automotive sector value chain: from spare parts producers to car manufacturers and sellers. Until recently, Brazil was expected to be one of the world´s fastest growing car markets. However, in 2014 domestic vehicle sales (including cars, light vehicles, trucks and buses) decreased 7.1%, to 3.5 million units, according to the Brazilian car producer association Anfavea. Production decreased 15.3%, to 3.15 million units, while exports declined 30.4%, mainly due to the still adverse economic situation in neighbouring Argentina, which is the main market for Brazilian car exports. The trade flow between both countries is affected by the restrictions on the freeing of US dollars in Argentina to pay for its imports. In the first half of 2015 vehicle sales decreased 17.5%, with passenger car sales declining 19%. This negative trend is expected to continue in the coming months, with sales forecast to contract 20% in 2015. Under pressure to reduce the public deficit, the Brazilian government has reinstated a consumer tax on new vehicles (IPI), which will raise prices between 4.5% to 7%, depending on the vehicle’s size. This means that Brazilian car businesses have to pass a higher tax burden on to consumers in an adverse economic environment. In addition, the Federal Government has started a deep spending review, cutting several projects and subsidy programs, and it is rather unlikely that it will have resources to support the ailing automotive sector. The accelerated depreciation of the real has made imports of cars and car parts even more expensive: importing cars into Brazil has always been more expensive due to the high taxes used to encourage foreign companies to establish local production plants. Against this backdrop, it is not surprising that profit margins of Brazilian automotive businesses have deteriorated sharply over the past 12 months, and this negative trend is expected to continue. The car industry’s high fixed costs mean that maintaining volumes is essential, and this has put pressure on suppliers and spare parts producers that have weaker financial structures and growing debts to service. Average payment times in this sector differ widely along the value chain: from 60 to 120 days. Car manufacturers normally have very long payment terms with their suppliers – some even exceeding 120 days - while steel/metal producers usually ask for shorter payment terms for sales to suppliers/spare parts producers, adding to the pressure they already have in terms of cash flow and high interest rates. 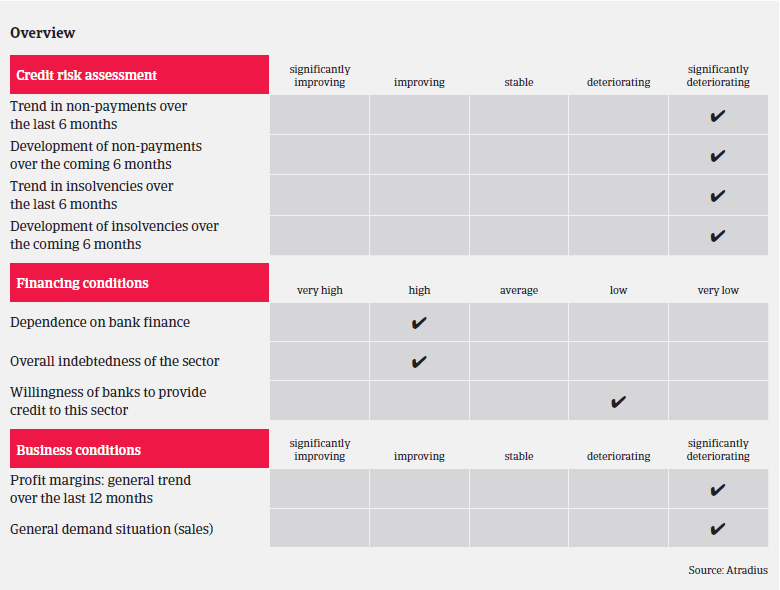 We have already seen a steep deterioration since the end of 2014, however, given the current problems along the whole automotive value chain, we expect both payment delays and defaults to continue to worsen markedly in the coming months. 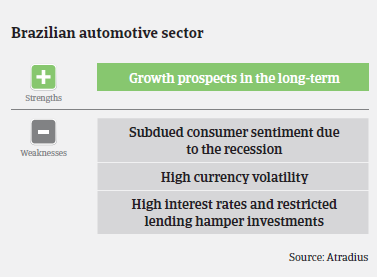 As a result, our current underwriting stance for all automotive subsectors and segments is cautious.